A Dobsonian telescope is an altazimuth-mounted Newtonian telescope design popularized by John Dobson in 1965 and credited with vastly increasing the size of telescopes available to amateur astronomers. Dobson's telescopes featured a simplified mechanical design that was easy to manufacture from readily available components to create a large, portable, low-cost telescope. The design is optimized for observing faint, deep-sky objects such as nebulae and galaxies. This type of observation requires a large objective diameter (i.e. light-gathering power) of relatively short focal length and portability for travel to relatively less light-polluted locations. Dobsonians are intended to be what is commonly called a "light bucket" operating at low magnification, and therefore the design omits features found in other amateur telescopes such as equatorial tracking. Dobsonians are popular in the amateur telescope making community, where the design was pioneered and continues to evolve. A number of commercial telescope makers also sell telescopes based on this design. The term Dobsonian is currently used for a whole range of large-aperture Newtonian reflectors that use some of the basic Dobsonian design characteristics, regardless of the materials from which they are constructed. It is hard to classify the Dobsonian Telescope as a single invention. In the field of amateur telescope making most, if not all, of its design features had been used before. John Dobson, credited as having invented this design in 1965  points out that "for hundreds of years, wars were fought using cannon on 'Dobsonian' mounts". Dobson himself identified the characteristic features of the design as lightweight objective mirrors made of porthole glass, and mountings constructed from plywood, Teflon strips and other low-cost materials. Since he built these telescopes as aids in his avocation of instructional sidewalk astronomy, he prefers to call the design a "sidewalk telescope". It appears that John Dobson simply combined all these innovations in a design that is focused towards one goal: building a very large, inexpensive, easy to use, portable telescope for the sole purpose of observing astronomical objects as a way to bring astronomy to the masses. Thin mirrors: Instead of costly Pyrex mirror blanks with the standard 1:6 thickness ratios (1 cm thick for every 6 cm in diameter) so they won't flex and sag out of shape under their own weight, Dobson used mirrors made out of surplus glass ship porthole covers usually with 1:16 thickness ratios. Since the telescope design has an alt-azimuth mount the mirror only has to be supported in a simple cell with a backing of indoor/outdoor carpet to evenly support the weight of the much thinner mirror. Construction tubes: Dobson replaced the traditional aluminum or fiberglass telescope tube with the thick compressed paper tubes used in construction to pour concrete columns. Sonotubes, the leading brand employed by Dobson, are less expensive than commercially available telescope tubes and are available in comparatively large sizes. Dobsonian scopes are intended to be transported out to dark sky locations, and Sonotubes are claimed to be more rugged than aluminum or fiberglass tubes which can dent or shatter from impacts. Sonotubes have the added advantage of being thermally stable and non-conductive which minimizes unwanted convection currents in the light path caused by handling of the tube assembly. A square "mirrorbox": Dobson used a plywood box for the tube base and mirror housing. This gave a rigid flat surface to attach the "carpet" support for the porthole mirrors he was using, and made it easy to attach the altitude bearings. A simple alt-azimuth mount: Dobson opted for a simple to build and use altazimuth mount. He used a “gun carriage type” design consisting of a flat platform ("ground board") on which sits a rotating box with semicircular depressions cut in the top for the altitude bearings ("rocker" or "rocker box"). All parts were made from plywood and other common materials. For the azimuth (side-to-side) motion Dobson used a combination of Teflon blocks turning on a flat Formica covered surface. For the altitude (up-and-down) motion, Dobson used a large diameter axle "closet flange" turning on Teflon bearing blocks attached to the altitude cutouts. Dobson's use of Teflon on all bearing surfaces and the large diameter of the bearings created a smooth action with a moderate amount of friction, so that a clamp mechanism is not necessary to prevent unintentional motion of the telescope. The design of Dobsonian telescopes has evolved over the years (see § Derivative designs), but most commercial or amateur-built "Dobsonian" telescopes follow many or most of the design concepts and features listed above. Altazimuth mount: An equatorial telescope mount with clock drive was left out of the design. Equatorial mounts tend to be massive (less portable), expensive, complicated, and have the characteristics of putting the eyepiece of Newtonian telescopes in very hard to access positions. Altazimuth mounts cut the size, weight and cost of the total telescope and keep the eyepiece in a relatively easy to access position on the side of the telescope. The altazimuth mount design used in Dobsonian designs also adds to simplicity and portability; there is no added mass or need to transport counter weights, drive components, or tripods/pedestals. Setting up for hard tube dobs simply involves placing the mount on the ground, and setting the tube on top of it. The weight of the Dobsonian style altazimuth mount is distributed over large simple bearing surfaces so the telescope can move smoothly under finger pressure with minimal backlash. The altazimuth mount does have its own limitations. Un-driven altazimuth mounted telescopes need to be "nudged" every few minutes along both axes to compensate for the rotation of the Earth to keep an object in view (as opposed to one axis for un-driven equatorial mounts), an exercise that becomes more difficult with higher magnifications. The altazimuth mount does not allow the use of conventional setting circles to help in aiming the telescope at the coordinates of known objects. They are known for being difficult to point at objects near the zenith, mainly because a large movement of the azimuth axis is needed to move the telescope pointing by even a small amount. Altazimuth mounts are also not well suited for astrophotography. Low cost to objective size ratio: From a cost perspective, a user typically gets more objective diameter per unit of cost with the Dobsonian design. Good "Deep Sky" telescope: The Dobsonian design of maximized objective diameter combined with portability makes the design ideal for observing dim star clusters, nebulae, and galaxies (deep sky objects), an activity that requires large objectives and travel to dark sky locations. Since these objects are relatively large, they are observed at low magnifications that do not require a clock-driven mount. Balance Issues: Designs that have the telescope tube fixed in relationship to its altitude bearings can be put out of balance by the addition or subtraction of equipment such as cameras, finderscopes or even unusually heavy eyepieces. Most Dobsonian telescopes have enough friction in the bearings to resist a moderate amount of imbalance; however, this friction can also make it difficult to position the telescope accurately. A modified Dobsonian from 1983 that features a collapsible open tube assembly with integrated bearing surface and a very compact "rocker box" mount. Two Dobsonians that combine a truss tube, compact "rocker box", large radius altitude bearings, and a collapsible design. From its inception, telescope makers have been modifying the Dobsonian design to fit their needs. The original design fit the needs and available supplies of one person—John Dobson. Other people devised variants that fit their own needs, abilities, and access to parts. This has led to significant diversity in "Dobsonian" design. “Classic” design tube assemblies would require a large van for transport. Designers started coming up with disassembleable or collapsible variants that could be brought to the site with a small SUV, hatchback, or even a sedan. This innovation allowed the amateur astronomy community access to even larger apertures. Many designs have combined the advantages of a light truss tube and a collapsible design. Collapsible "truss tube" Dobsonians appeared in the amateur telescope making community as early as 1982 and allow the optical tube assembly, the largest component, to be broken down. As the name implies, the "tube" of this design is actually composed of an upper 'cage assembly', which contains the secondary mirror, and focuser, held in place by several rigid poles over a ‘mirror box’ which contains the objective mirror. The poles are held in place by quick-disconnecting clamps which allow the entire telescope to be easily broken down into its smaller components, facilitating their transport by vehicle or other means to an observing site. These truss tube designs are sometimes incorrectly called a Serrurier truss, but since the main truss is not built with an opposing mirror cell truss it only performs one function of that design, i.e. keeping the optics parallel. The main attribute of a Dobsonian's mount is that it resembles a "gun carriage" configuration with a "rocker box" consisting of a horizontal trunnion style altitude axis and a broadly supported azimuth axis, both making use of material such as plastic, Formica, and Teflon to achieve smooth operation. Many derivative mount designs have kept this basic form while heavily modifying the materials and configuration. Many designs have increased portability by shrinking the altazimuth (rocker box) mount down to a small rotating platform. The altitude trunnion style bearing in these designs becomes a large radius roughly equal to or greater than the radius of the objective mirror, attached to or integrated into the tube assembly which lowers the overall profile of the mount. The advantage of this is that it reduces the total telescope weight, and the telescope's balance becomes less sensitive to changes in the weight loading of telescope tube from the use of heavier eyepieces or the addition of cameras etc. Since the late 1990s many innovations in mount design and electronics by amateur telescope makers and commercial manufacturers have allowed users to overcome some of the limitations of the Dobsonian style altazimuth mount. Digital setting circles: The invention of microprocessor-based digital setting circles has allowed any altazimuth mounted telescope to be fitted or retrofitted with the ability to accurately display the coordinates of the telescope direction. These systems not only give the user a digital read-out for right ascension (RA) declination (dec.), they also interface with digital devices such as laptop computers, tablet computers, and smartphones using live ephemeris calculating / charting planetarium software to give a current graphical representation of where the telescope is pointing, allowing the user to quickly find an object. Equatorial platform: The use of equatorial platforms (such as the Poncet Platform) fitted under the altazimuth mount has given users limited equatorial tracking for visual and astrophotographic work. Such platforms can incorporate a clock drive for ease of tracking. The intent of the Dobsonian design when it originated in the 1960s was to provide an affordable, extremely simple, and rugged large-aperture instrument at low cost. These same attributes facilitate their mass production. One of the first companies to offer the Dobsonian commercially was the now defunct company Coulter Optical (now part of Murnaghan Instruments). They helped popularize the design with models in the 8 inch through 17½ inch size range in the 1980s and 1990s that were built using Dobson's original concept. Meade Instruments, Celestron and other manufacturers began to introduce their variation on this design by the late 1990s. Although manufactured scopes include such niceties as metal tubes and more refined hardware, these telescopes are still extremely affordable. In late 2006, 6 inch models cost around US$300 and 10 to 12 inches (250 to 300 mm) scopes can still be had for under US$1,000. Since the late 1990s, Dobsonians using the truss tube design have become increasingly popular with manufacturers. In 1989, the first commercial truss tube Dobsonian was released by Obsession Telescopes into the market. Manufacturers of these truss tube Dobsonians differentiated themselves by going in the opposite direction from John Dobson's original intent by catering to the upper end of the market and more experienced observers. These telescopes came with full-thickness mirrors and used higher-end materials such as Baltic birch or similar plywood, and cast aluminum fittings. These designs also employed the "rocker box" mount listed above. As of the early 2000s these truss tube Dobsonians are the largest commercially available telescopes, with three manufacturers offering models in the 24 inches (610 mm) to 30 inches (760 mm) range (hard tube and other reflector designs typically stop at 18 inches (460 mm) due to the size of the tube). As of March 2010, Orion Telescopes & Binoculars offers the largest commercially available truss tube Dobsonian, a 50″ aperture model. As these scopes require teams of several people to operate, and require the observer to perch on top of a ladder, the market for these scopes is limited. Telescopes with a 15 to 18 inches (380 to 460 mm) aperture appear to be the most popular size, as they maximize the amount of aperture yet can still be easily be set up by one person. In early 2009 prices can range from US$800 for a 12″ instrument to US$3500 plus for 18″ or larger instruments, depending on the quality and features. The Dobsonian design is considered revolutionary due to the sheer size of telescopes it made available to amateur astronomers. 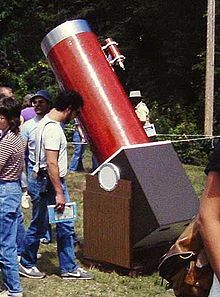 The inherent simplicity and large aperture of the design began to attract interest through the 1970s since it offered the advantage of inexpensive large instruments that could be carried to dark sky locations and star parties in the back of a small car and set up in minutes. The result has been a proliferation of larger telescopes which would have been expensive to build or buy, and unwieldy to operate, using "traditional" construction methods. Whereas an 8-inch Newtonian telescope would have been considered large 30 years ago, today 16 inch systems are common, and huge 32 inch systems not all that rare. In combination with other improvements such as narrow-pass filters and improved eyepieces, the large apertures of the Dobsonian have dramatically increased the depth to which an amateur astronomer can penetrate into the universe. Whereas the amateur astronomer of the 1970s and 1980s typically did not explore much beyond the Messier and brighter NGC objects, the amateur astronomer of today, thanks in part to Dobsonians, can routinely observe objects in the IC, Abell, Perek Kohoutek, Minkowski, and other obscure catalogues once considered the domain only of professional astronomers. ^ This ratio ensures that per inch of objective diameter, a Dobsonian will weigh less and require less space than other types and is thus the most portable design. ^ a b c Newton, Jack; Teece, Philip. The Guide to Amateur Astronomy. p. 287. ^ Ferris, Timothy. Seeing in the Dark. p. 39. ^ Allison, Mark. Star Clusters and how to Observe Them. p. 74. ^ a b "Walden of the Sky". 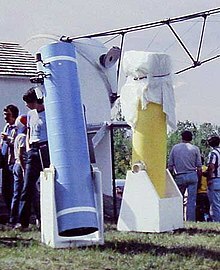 Sky & Telescope: 84–87. September 1995. ^ DiBona, Chris; Stone, Mark; Cooper, Danese. Open Sources 2.0. p. 351. ^ Fred Watson. Why is Uranus Upside Down?. Inc NetLibrary. p. 17. ^ Knoll, Peter. Induced Seismic Events. p. 25. ^ Albert, David H. And the Skylark Sings with Me. p. 93. ^ Newton, Jack; Teece, Philip. The Guide to Amateur Astronomy. p. 288. ^ Grego, Peter. Moon Observer's Guide. p. 60. ^ "Recommendations for Beginning Amateur Astronomers, page 4" (PDF). South East Queensland Astronomical Society Inc.
^ Hamberg, Ivar (Fall 1982). "An Extremely Portable 17½″ Dobsonian". Telescope Making. No. 17. ^ Hamberg, Ivar. "The 17.5″ Dobsonian". telia.com. ^ Newton, Jack; Teece, Philip. The Guide to Amateur Astronomy. p. 289. ^ Andico, Orly (January 11, 2012). "Arduino bluetooth digital setting circles for telescopes". ^ Ward, Peter (December 1993). "Digital Setting Circles Revisited – Lumicon Sky Vector I – JMI NGC-MAX – Celestron Advanced Astro Master". Test Report. Sky & Space. ^ Dobson, John L. (1991). Sperling, Norman (ed.). How and Why to Make a User-Friendly Sidewalk Telescope. Everything in the Universe. pp. 61–62. ISBN 0-913399-63-9. – The book treats the "why" as importantly as the "how", sharing Dobson's philosophy on the importance of popular access to astronomy for proper appreciation of the universe. ^ Peterson, Dave (January 9, 2010). "Orion's Monster Dobsonian Telescope will be the Talk of your Backyard Cookout". gadgetytech.com. Archived from the original on June 1, 2010. ^ Hitt, Jack (2012). Bunch of Amateurs: A Search for the American Character. Crown/Archetype. pp. 231–234. ^ Cooke, Antony (2006). Visual Astronomy Under Dark Skies: A New Approach to Observing Deep Space. Springer Science & Business Media. p. 156. ^ English, Neil (2012). Classic Telescopes: A Guide to Collecting, Restoring, and Using Telescopes of Yesteryear. Springer Science & Business Media. p. 127. ^ Mullaney, James. A Buyer's and User's Guide to Astronomical Telescopes and Binoculars. p. 38. Moser, Don (April 1989) "A Salesman for the Heavens Wants to Rope You In", Smithsonian Magazine. Mobberley, Martin (2004). The New Amateur Astronomer. Springer Science & Business Media. p. 21. ISBN 978-1-85233-663-9. Albert, David H. (1999). And the Skylark Sings with Me: Adventures in Homeschooling and Community-based Education. New Society Publishers. p. 92. ISBN 978-0-86571-401-4. Woodruff, John. "Dobsonian". Firefly Astronomy Dictionary. p. 60. Ferris, Timothy (2003). Seeing in the Dark: How Amateur Astronomers Are Discovering the Wonders of the Universe. Simon and Schuster. p. 37. ISBN 978-0-684-86580-5. Kriege, David; Berry, Richard (1997). The Dobsonian Telescope: A practical manual for building large aperture telescopes. Willmann-Bell. ISBN 0-943396-55-7. Wikimedia Commons has media related to Dobsonian telescopes. This page was last edited on 28 March 2019, at 02:05 (UTC).